One of the worst phone calls you can get as a trial lawyer is from your examining expert, who reaches you on your cell phone saying, "We've got to talk. It's urgent." I had already amassed the thousands of pages of my client's school and medical records (at great expense), and had just laid out a substantial sum to my expert to review the records in anticipation of trial down the road. So, naturally, I reach out to my designated expert, thinking that perhaps he just realized that he has a scheduling conflict, or that, after looking more deeply into the case, he suddenly noticed that he was conflicted out of the case because he knew some of the defendants' witnesses personally. If only I were so lucky. Me: "Hey, doc, I got your urgent message. What's going on?" Dr: "I reviewed the defendant's expert's test results, and it certainly seems like your client was not compliant at her examination, and was greatly exaggerating her symptoms." Me: "OK, that's not good news, but that's certainly not unheard of. Is there some way we can get around that?" Dr: "That would be tough in this case, because the scoring for the test is done by computer. It's objective, not subjective." Me: "Is there something else you're concerned about? From your message, you seemed really troubled." Dr: "Um, yes. Jonathan, I went back and cross-checked your clients' deposition testimony against the medical records. And, um ...."
Dr: "And I can't back up anything they're claiming. The school records don't back up the parents' claim that her grades fell off as a result of this incident, and the mother's claim that "she was totally different" after the accident is contradicted by her statement at the hospital that "No one in the family wanted to talk to her before the incident because she was the family weirdo ..."
"Simply put, Jonathan, I can't - I won't - state to a reasonable degree of certainty that anything she suffered was directly caused by what happened to her at school." At the risk of stating the obvious: You settle the case. The decision part is easy; it's the implementation of the solution that's particularly hard. I admit it; I had been fooled by these clients. When I met them in person, I found them credible people. So, I called them into my office, and showed them their deposition testimony - and then showed them the specific records that undercut (nearly) every one of their claims. "[We] don't know who those doctors are. [We] never said any such thing. And they're lying." At that point, the sarcastic branch of my brain was going wild; you mean to tell me that two different doctors at two different, reputable hospitals, somehow guessed your child's name, date of birth, social security number and date of injury, just to conspire to hurt your case? Truthfully, getting these particular clients to see the light of day, and accept that they weren't going to see the big pay day they were hoping for was extremely challenging, to say the least. But, in the end of the day, without a medical expert in the relevant discipline, you simply can't prove you've sustained a medical injury that was directly caused by the defendant's negligence. And if that happens, your case will be dismissed, period. If you think you can game the system and try to collect untold gobs of money by blaming all your problems on one incident with someone else - regardless of whether it is legitimately connected to that incident or not - guess again. It won't fly, because sooner or later, your lies will catch up with you, and a half-decent lawyer on the other side (which we had in this case) will shred you with it - that is, assuming you can even get an expert to back up your (weak) claims in the first instance. 1 Comments to "When Clients Lie - And Get Caught"
Can understand why You'd be furious, not merely disappointed. Conflict here between obligation to represent Client zealously and various ethical as well as pragmatic considerations. For example, if we ourselves believe client/ or important witnesses have or would be perjuring themselves ; do we tell them we may not be able to put them on the stand should matter ever get to trial? If they should testify as a narrative without our having elicted the probably false testimony; to what we have concluded is likely untrue; can we sum up on it? 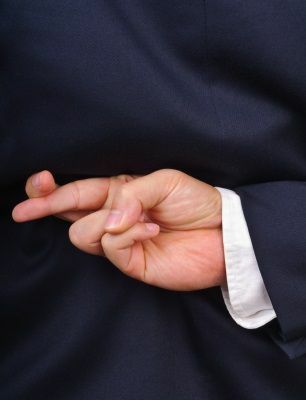 Post a Comment to "When Clients Lie - And Get Caught"